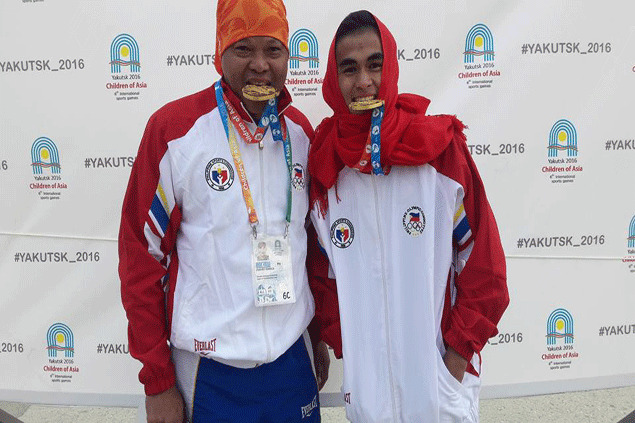 BOXER Criztian Pitt Laurente claimed the Philippines’ first gold medal in the Children of Asia International Games in Yakutsk, Russia. Laurente delivered solid punches to the face of the equally talented Kazakh, an Asian junior medalist. Coach Ronald Chavez said he knew from the opening round Laurente could win the gold as the Kazakh became conscious of his movements after being hit by the Batang Pinoy champion several times at the onset. Sprinter Veruel Verdadero and taekwondo jin Beatrice Kassandra Gaerlan also made the country proud by seizing two bronze medals. The 15-year-old Verdadero clocked 23.17 seconds in the boys’ 200m behind gold medalist Shalika Santhush of Sri Lanka (22.97) and Saudi Arabia’s Al Marwani Ahmed (23.14). The Philippines has so far took home one gold, one silver, and four bronze medals in the 44-nation event that features the best 16-and-under athletes from Asia and Russia.